Today it was rainy as yesterday. When it rainy it frustrated me because I can’t go anywhere to take pictures. Anyway I went out to check out the outside condition and I found two green birds came to the cherry tree next to our building. Do you know why they came? ……. This entry was posted in Flower, nature, Pension Sakuraya on 2009年1月31日 by izusakuraya. We have some kinds of Sakura in our garden. But this tree has already had a lot of blossoms. 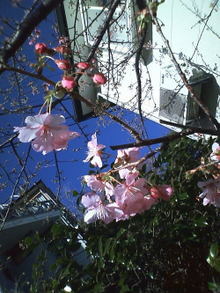 This Sakura is one of kinds of Kawazu Sakura which is very famous for blooming earlier than Yomeiyoshino. But I planted its seed several years ago, in another word, this sakura is raised from seed. So this sakura is a little different from real Kawazu Sakura. This entry was posted in Flower on 2009年1月29日 by izusakuraya. "We couldn’t see a beutiful sunrise this morning, but we are lucky because we could take a picture of gorgeous sunrise yesterday morning." Our guests who came from Taiwan and stayed for 2 nights said so when they checked out this morning. As usual I went to the primary school with my daughter this morning and I took this picture on the way to home. It wasn’t clear by cloud on the horizon this mornig, so our guests couldn’t get beautiful senery. The weather forcast says it will be a little warmer after the middle of this week. By the way do you have hey fever? We have to worry about it after Wednesday because it will be warm after that. This entry was posted in nature on 2009年1月28日 by izusakuraya. 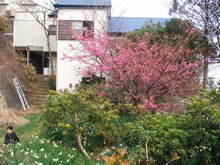 In our garden we have some kinds of cherry blossom, and this is one of them, called "Kawazu Sakura". Every year we have "Kawazu Sakura Festival" in Kawazu town and Minami Izu town on February and March. "This tree is blooming early in this area." 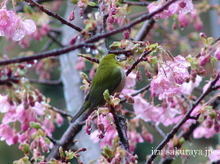 He has a lot of cherry trees in his field but most of them have only 1 or 2 cherry blossoms. I think this tree will be fully bloomed at the beginning of February. I’m looking forward to seeing that. This entry was posted in Flower on 2009年1月26日 by izusakuraya. Have you ever gotten on this train? This train is called Limited Express Train "Super View Odoriko". If you travel to Shimoda with small child by train from Tokyo area I recommend you this train because this train has a particuler space for children….. 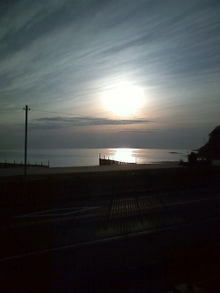 This entry was posted in Family, Travel on 2009年1月23日 by izusakuraya. We had 3 holidays until yesterday and we went to my wife’s home in Kanagawa. My children were very happy because they could meet thieir cousins and spend thier time with them. By the way I went to Shirahama beach after 3 days with my son, Yuuki this afternoon. He is stressful because he often stay in our home all day, so when we went to the beach he started to run soon. I show you pictures which I took today….. 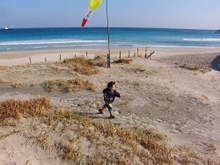 This entry was posted in beach, Family on 2009年1月19日 by izusakuraya. This morning, I walked with my daughter as usual, and when I was coming back home I found an interesting phenomenon on the beach. It was a Frost smoke or an ice fog caused by extremely cold air flowing over a body of comparatively warm water. The lowest temprature of Shirahama area was about 5 degrees, but the water was over 17 degrees in this season. That’s why I could see this phenomenon this morning. 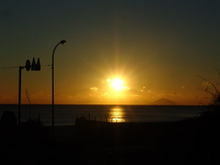 This entry was posted in beach, nature on 2009年1月16日 by izusakuraya. Today, the time of sunrise was 6:54 am. I started to go to the shool with my daughter and the children at 7:00 am as usual and I walked down the hill. I found that the sun was shining in the cloud and took this photo. This morning I could see the sun with cloud and it was gorgeous scenery. In the afternoon I went to Shimoda for shoping by bike and ……. 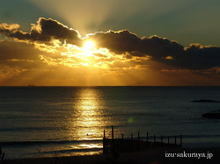 This entry was posted in nature, Sea on 2009年1月15日 by izusakuraya. It was very cold today too like yesterday. I walked with the children who go to Shirahama elementary school as usual this morning. "Look at this! 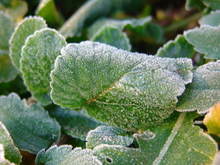 The leaf is frozen!!" Actually the water is frozen on leaves because of the low temprature. 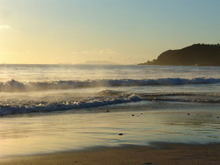 This entry was posted in nature, Sea on 2009年1月14日 by izusakuraya. This morning I started to walk to the elementary school at 7:00 am with my daughter and the other children as usual. When we went down the hill the sun was just rising up next to Toshima island. "Look at this! The water is frozen here!" The sea water is about 17 degrees even in this season but the water outside is sometimes frozen. This entry was posted in nature on 2009年1月13日 by izusakuraya.